Saint-Gobain Gyproc Middle East, the Abu Dhabi-based lightweight building systems manufacturer, has become the latest company to be awarded prestigious EPC (Environmental Performance Card) approval by the UAE Ministry of Environment and Water. 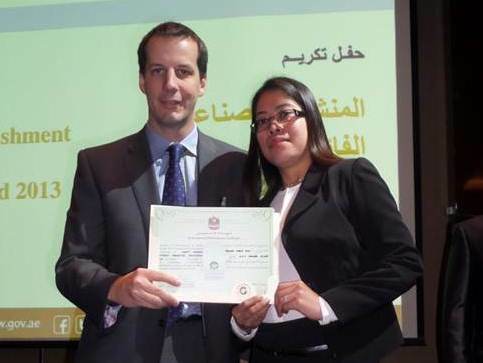 The award, which follows a successful environmental audit in December, was presented to the company’s Plant Manager, Daniel Easter, and Environmental Co-ordinator, Sheryl Salazar, at a special ceremony on the 9th January 2014. The EPC scheme is designed to promote cleaner, greener, production across the UAE by raising the efficiency of industrial processes, cutting emissions and raw material wastage and reducing the use of hazardous substances in manufacturing. To obtain EPC approval, Gyproc had to first apply for registration under the scheme and then demonstrate its commitment to UAE laws and regulations governing environmental protection and development. It was required to show that it had robust systems and procedures in place to ensure safe environmental management and support this through an Environmental Impact Assessment and reports on Air Quality and Waste Management. Gyproc’s Daniel Easter is delighted that the company’s commitment to excellent environmental performance has been recognised. “As the world leader in habitat and construction markets, Saint-Gobain is committed to environmental protection and has implemented clear strategies to reduce the impact of its global manufacturing operations on the environment, at all levels. The award coincides with the publication, in December, of Gyproc’s first environmental brochure, laying out in detail the environmental benefits of the plasterboard -based lightweight building systems, and explaining the work being done by Gyproc Middle East in key areas like training and plasterboard recycling.